I recently decided that it was time to try a new farmers' market. Since I tend to be a creature of habit...and I have made a habit of my old market (shopping there every Saturday during the growing season for more than fifteen years)...switching to another is kind of a big deal. The reasons for the move are too numerous and personal to share. I will only say here that it was time for a switch...at least for a while. There are of course many things I will miss from my old market. Two or three vendors in particular I will miss so much that I'll probably take the time to swing by my old market occasionally just to say hello and purchase some of my favorite items. But for the most part I am enjoying the new one very, very much. My new market, the Brookside Farmers' Market, is not really new. It has been around for more than 10 years. I might have even visited once or twice before. But for some reason it has never caught my fancy in quite the way it did when I wandered into the midst of the stalls a couple of weeks ago. 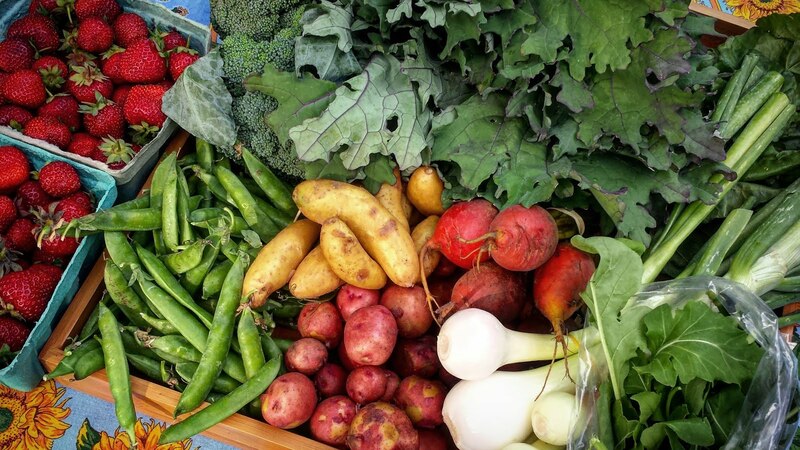 There is much at the Brookside Market that appeals: It is an all local (everything comes from within 100 miles), all organic, vendor run market. Best of all—as far as I'm concerned—is the fact that no re-sale is allowed. The vendors are also the producers. The consequent pride with which they display their products is evident in the beautiful, visual feast that greets you at each and every stall. These vendors are intimately acquainted with their produce...and are pleased and proud to tell you about it. Since I have posted less frequently than usual in recent weeks, it would be tempting to assume that I might have been feeling a bit uninspired. But this is not the case at all. Rather, I have just been experiencing the normal busy-ness of June (looking back at the frequency of posting in previous Junes will bear this out). 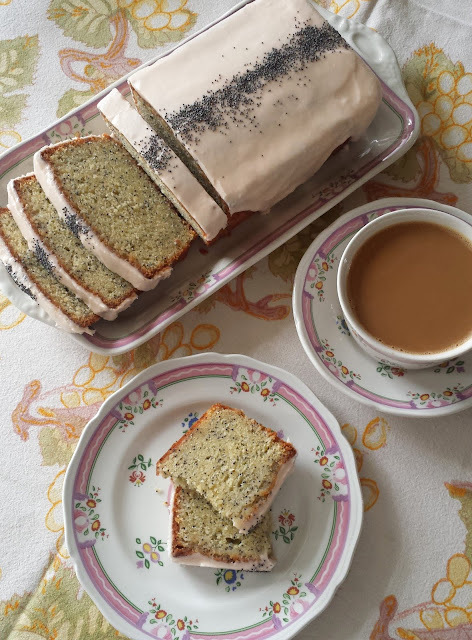 I have actually been feeling more inspired by the beautiful things I have been bringing home with me from the Brookside Market...I just haven't had the time to write a post. (If you follow me on Instagram, I have been trying to at least take a few pictures...). It is my hope that my blog will reflect this newfound inspiration during the months ahead. 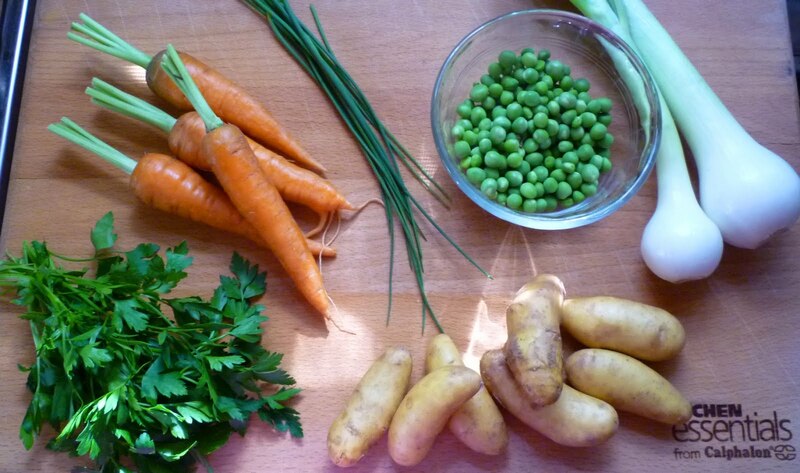 small and tender carrots, and sweet shelling peas (unfortunately, the last ones of the year), it is a perfect example of what I love about market cooking: There is nothing exotic...or complicated...about it. Rather, the final dish is just a thoughtfully composed and carefully prepared combination of the best the season has to offer.... The goal is simply to allow each vegetable to shine. I am of course including the recipe for the ragoût at the end of the post, but if you have never prepared a simple mixed vegetable ragoût, you might want to read the post I wrote a few years ago on how to build a seasonal vegetable ragoût. I think you will find it to be quite helpful—not only for preparing this particular ragoût, but also for creating your own ragoûts as the growing season progresses. 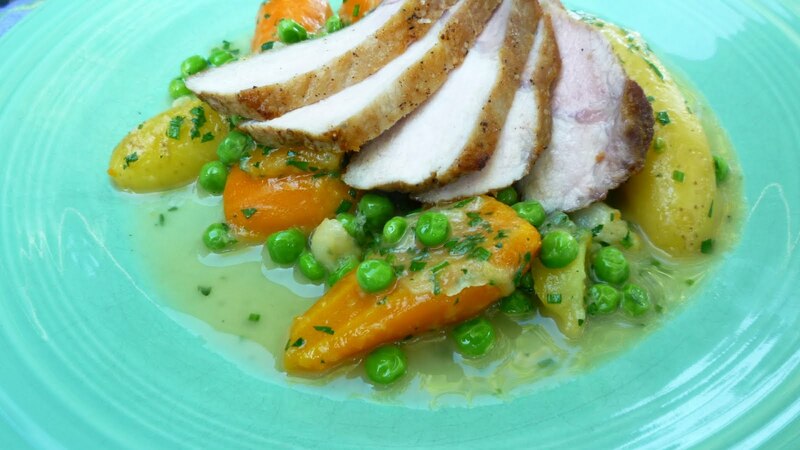 If you would like to serve your ragoût as I did with pork or chicken, you can find instructions for cooking the pork in a post I wrote last spring (just omit the sage... or not... I'm sure it would be delicious....) and for cooking the chicken in a basics post from several years ago. If you do choose to serve the ragoût with a pan-fried or roasted chop or cutlet of some kind, don't forget to deglaze the pan with a bit of white wine...or stock...or water...and then add these deglazings to the ragoût at the end. This small step will add flavor and at the same time tie the meat to the ragoût, creating a more unified plate. 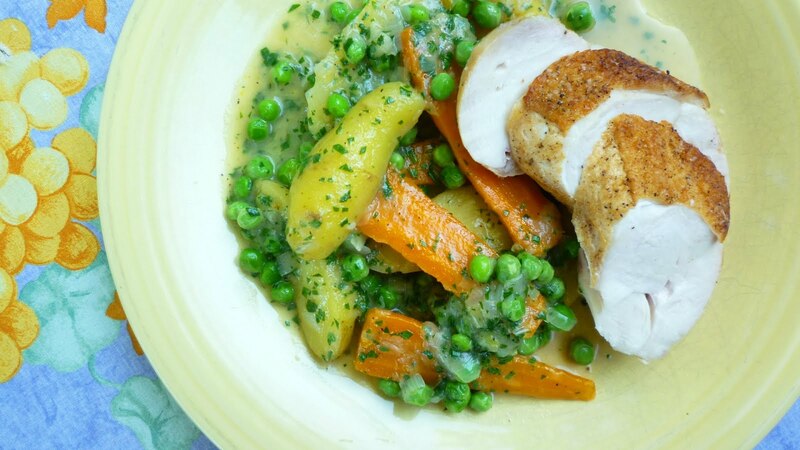 Finally, if you are looking at this post and thinking that you are just looking at a plain old dish of potatoes with the dreaded childhood combination of peas and carrots, I can assure you that this dish—when made with fresh, in-season ingredients—is a revelation of just how good these humble vegetables can be. Set a sauté pan that is wide enough to hold all the vegetables in a snug single layer over medium heat. Add the oil and a tablespoon of butter. When the butter is melted, add the onions, garlic and carrots along with a generous pinch of salt. Gently sweat, stirring occasionally, until the onions are just tender—about 5 minutes. Add the potatoes and stir to coat in the fat and onions. If the pan seems dry, add a bit more butter. Season with salt. Add stock to a depth of about 1/2 inch. Bring to a simmer. Cover with a tight fitting lid, reduce the heat and simmer gently until the carrots and potatoes are just tender—about 15 minutes. Add the peas, cover and continue to cook until the peas are tender...another 3 to 5 minutes. Uncover. If you have pan deglazings from a cutlet or chop, add them now. Taste and correct the seasoning with salt and freshly ground black pepper. If the ragout is too dry for your liking (the finished stew should be a bit broth-y...but how broth-y is up to you), add more stock or water...tasting and correcting the seasoning again. Bring to a gentle simmer, add the herbs and swirl in the remaining butter. Serve immediately. Serves 2 (see notes). To prepare the onions, trim the root and tough green and then split the onions lengthwise. If there is a fibrous or tough shoot in the center, remove and discard it. Cut the halves lengthwise in 1/2 to 3/4-inch intervals. Slice these strips thinly (1/4-inch or so) crosswise. At this point in the season the dark green portions of the onions are becoming tough and bruised. If you are making a ragout earlier in the season and the green portions are still tender and fresh, by all means add them too...they may be added during the early stages of the cooking with the white of the onions, or tossed in at the end more like an herb. 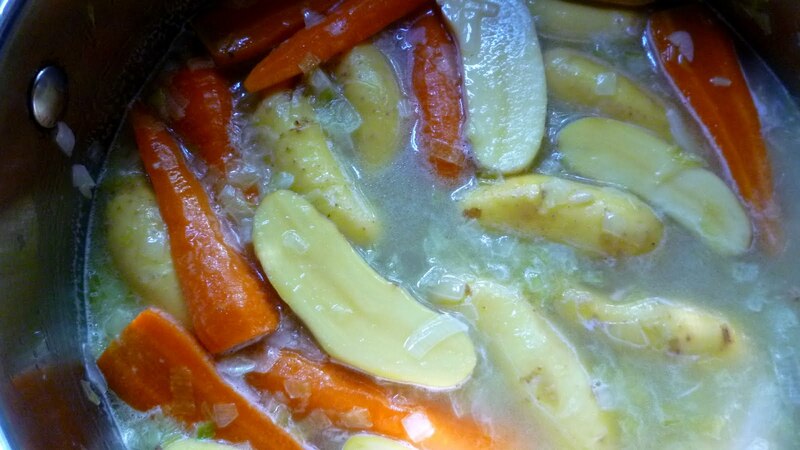 You may leave some of the green tops (a half inch or so) on the carrots if they are nice and you prefer. 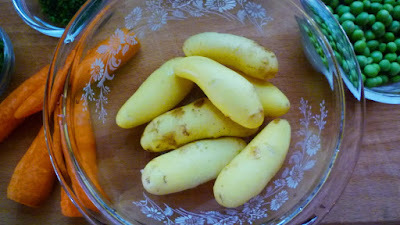 If the carrots are very small (1/2-inch in diameter), it is not necessary to halve them lengthwise. 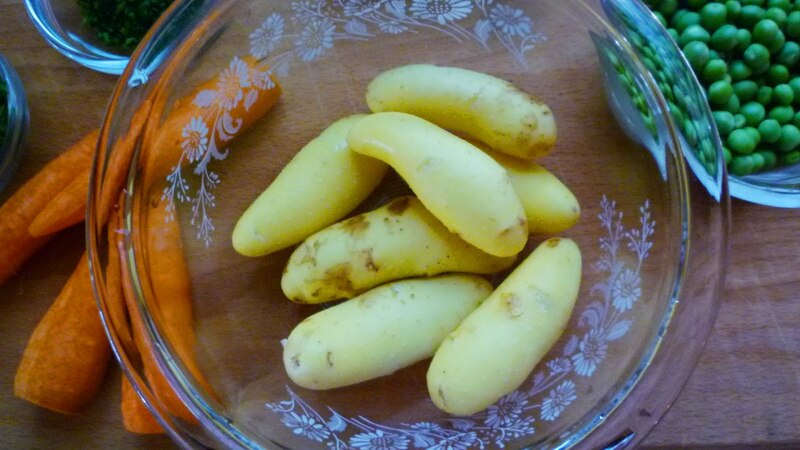 If your fingerlings are not "new", simply scrub them and leave the skin intact. 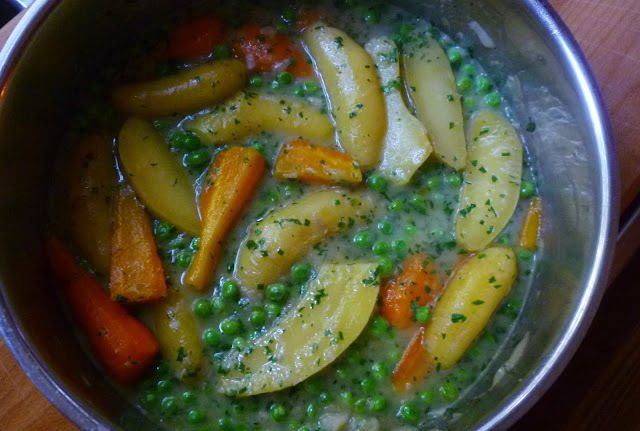 If you are not comfortable estimating how long the peas will take to cook and you don't want to risk under or over cooked carrots and potatoes, you may blanch the peas separately in boiling salted water. Shock in an ice bath or under cold running water to stop the cooking process. Add with the herbs and butter. This recipe is for two but it can obviously be increased to feed as many as you like. Simply make sure you choose a pan that will hold all of your vegetables in a snug single layer. 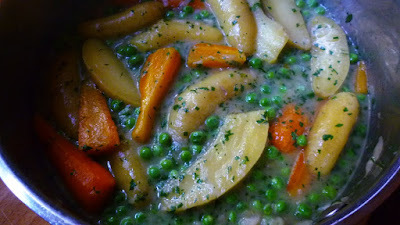 A little overlap is OK...but if the vegetables don't have enough room to move you might end up with a mix of over and undercooked vegetables...it is better to use two pans...perhaps cooking the carrots in one and the potatoes in another...and combining them quickly at the end with blanched peas (see previous note), butter and herbs.